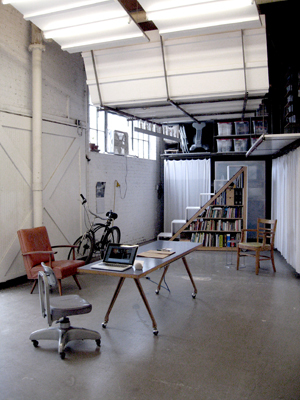 The outside-in-loft is an experimental project in my industrial studio space to construct the equivalent functions of a bedroom, and adjoining, all personal storage, without obstructing any light from a main window or reducing the square footage of the floorplan. 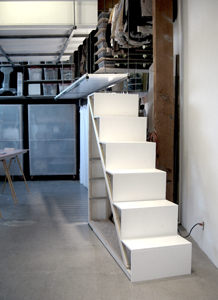 The upper areas are organized by function and fixed, while wheeled storage units at floor level preserve a flexible open space. The exposed architecture of the building which reveals services and construction, is the context for this design, which jumbles inside and outside, revealed and hidden, front and back, muddling the normal cues in residential and commercial architecture that indicate where you are meant to be. 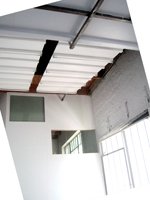 The sleeping platform with visible joists every 16” conforms to the 4’ standard of American construction and this ‘unfinished’ ceiling seen from the public space below is a seamless floor viewed from above. This repetition of relative ‘sidedness’ continues to the lighting structures where the spacing of joists aligns with the original ceiling beams above. This design organizes opposing concepts on a three dimensional axis so that your position in the space alters your perception in a similar way to moving a point on a gradient. It is a fluid space, different from an architectural box where the choice is either/or, in or out. Of course, all of the explanations and the conceptual underpinning drift away when you are up in this loft space, on a level with branches and leaves just outside the window, and it’s as comforting and cool as a childhood tree fort! 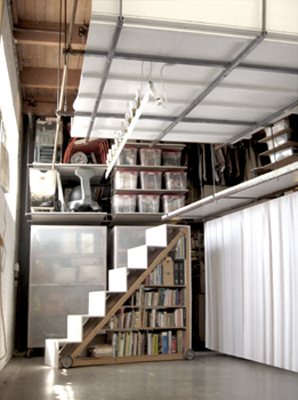 clockwise from top left: stairs on wheels hold books, a slatted walkway leads to a dressing area, closet and the bed; raised up from the walkway, the sleeping platform angles up for reading and relaxing and is wide enough to function as side tables; the fluidity of opposing qualities of the space can be illustrated as possible positions on an x,y,z axis; the stairs can be placed at several points along the walkway; the lighting structures have down lighting for tasks and uplighting for ambient light, with the large railroad door in the center of the space open during the day, the brightness of these panels indicates the amount of light bounced back into the space.